The Sweet Almond, the Bitter Almond, and the Flowering Almond are all of a kin, and in this kinship many include also the peach and the nectarine. 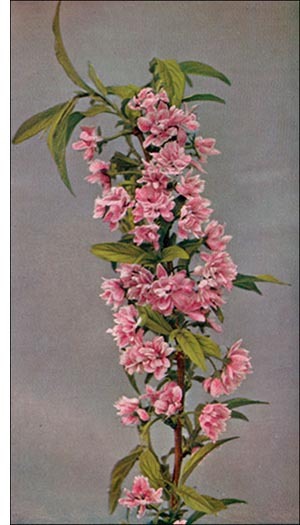 The flowering almond or the dwarf almond is a shrub which early in the spring, in March or April, sends forth its fair, rosy blossoms before its leaves are sprouted. The shrub seldom exceeds three feet in height. The leaves are like those of the willow, only darker and of a more shining green. It is really a native of Calmuck Tartary, but now is used extensively in gardens, because it blooms so early and can easily be cultivated in any dry soil. The almond tree figures in history, mythology, and poetry. In this connection it is interesting to note that Aaron's famous rod was the shoot of an almond tree. Virgil, in the Georgics, welcomes the almond, when covered with blossoms, as the sign of a fruitful season. In ancient times, everything that was considered of any importance to the Greeks had some connection with the siege of Troy. Demophon, returning from Troy, suffered the fate of many another Greek worthy. He was shipwrecked on the shores of Thrace. He was befriended by the king and received as a guest. While at the court he met the beautiful daughter of his host. Immediately he fell in love with the charming princess, gained her love in return, and made arrangements for the marriage. But Demophon was obliged to return home to settle up his affairs before he could take upon himself these new ties. So the youth sailed away, but never to return. The princess, faithful Phyllis, watched and waited, hoping in vain for the return of her promised lord. Her constancy was noted even by the gods, who, when she was gradually pining away, turned her into an almond tree. Since then this tree has been a sign of constancy and hope.